Mombasa Island is a 5 by 3 km (3.1 by 1.9 mi) coral outcrop located on Kenya's coast on the Indian Ocean, which is connected to the mainland by a causeway. The city of Mombasa is located on the island. The old town of Mombasa is located at the eastern, seaward end of the island. Kilindini and Port Reitz, the modern deepwater harbour and port separates the island from the Kenyan mainland to the south. The old harbour, which is named Port Tudor and guarded by Fort Jesus, and Tudor Creek separate the island from the northern mainland. Modern residential sprawl and industrial areas now occupy the rest of the island. Mombasa is linked to the mainland by the Makupa Causeway to the northwest, by the Nyali Bridge to the east and by the Likoni Ferry to the south. A road and rail bridge also serve the mainland container port near Port Reitz. Port Tudor and Tudor Creek were named by Owen Tudor the Royal Navy captain who first surveyed the area. Before the Second World War one could forecast with some degree of certainty the sequence of events that would make up the average “season”. The season used to start, and still does for many, with the ripening of the dates in the valleys of the Tigris and Euphrates. This used to be the principal date-growing area of the world, but is now fast being outstripped by California as a world supplier. The ripe dates are carried down to Basra where they are boxed. At this time the dhows converge on the southern end of the Basra River and make their way up to Basra itself to load them. So important is this aspect of dhow economy that one does not estimate the size of a dhow by its displacement of water in tons but by the number of boxes of Basra dates that it is capable of carrying. Dates are their universal “currency” and are used indirectly to purchase goods from port to port. Items bought might be sold again at the next port and so a favourable trade balance is built up. Most Nakhodas have an “Agent” at the various ports, who gives advice as to what commodity to buy for sale at another port where a demand exists. 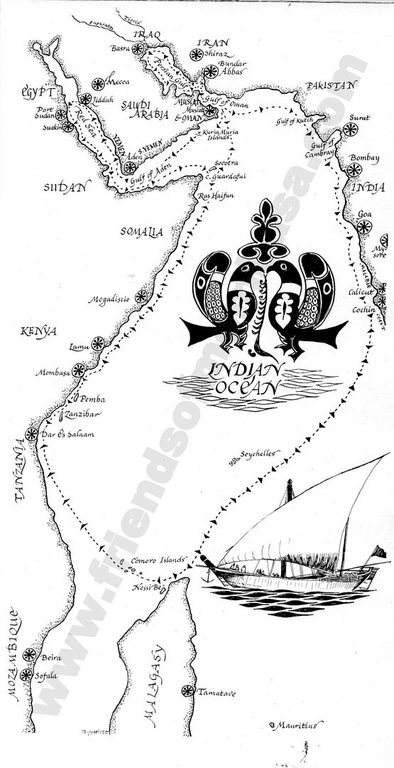 Thus these ships travel down the Persian Gulf into the Gulf of Oman and thence into the Indian Ocean where they generally set a course westward along the Hadhrami Coast to Aden, (though some travel east to the Malabar Coast). They then trade up the Red Sea and, should the time be appropriate, may even carry pilgrims to Jeddah for the Sacred Haj. Eventually they make their way back to Aden. Here they lie up and refit to a certain extent in preparation for the southern leg of their journey. They wait for the time of the change of the Monsoon and, whilst waiting, the Nakhoda may take the opportunity to travel along the South Arabian coast seeking merchandise for trade and barter in East Africa. When the Monsoon is about to change they sail eastward to a point near the Kuria Muria Islands so that, when they alter course, the Monsoon will carry them almost direct to Ras Haifun, to the South of Cape Gardafui. Having made their landfall the> pass between the islands off the Cape and make their way southward with Africa almost always in sight c*i their starboard hand. 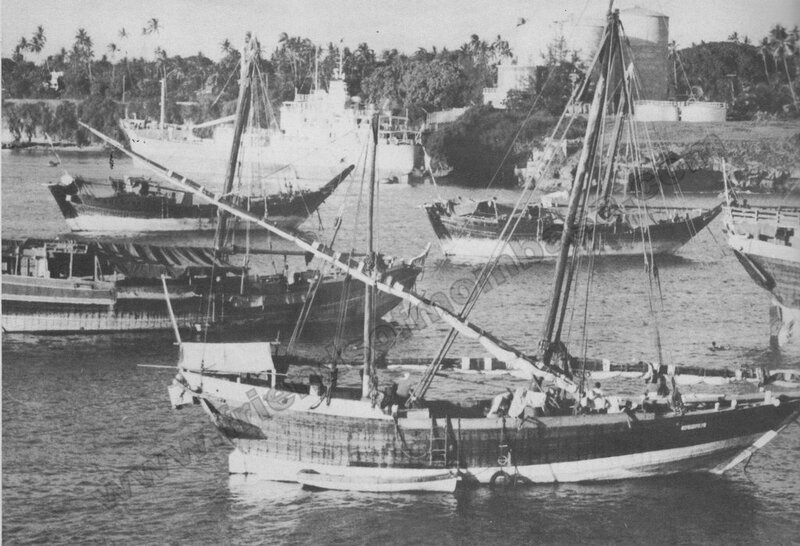 Before the so called revolution Zanzibar was the traditional cad of the voyage, even though the dhows might later travel further south to load boriti poles. On the journey to Zanzibar several ports such as Mogadiscio. Kismayu, Lamu and Mombasa, would be visited. 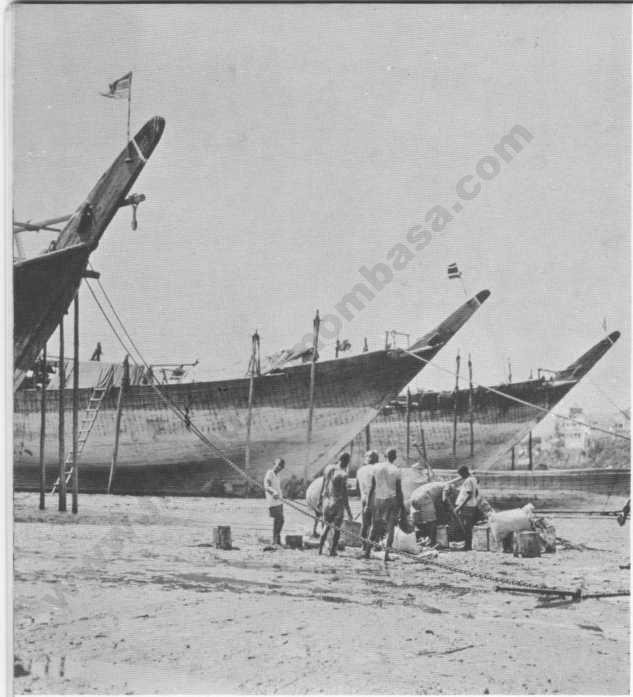 Although the majority of dhows used to unload their main cargoes at Zanzibar, and lie up there until the Monsoon changed to blow them before it on their homeward passage, a considerable number would make Mombasa their port for dis-charge and trade. Nowadays, however, Mombasa is the principal terminus of the dhow journey. 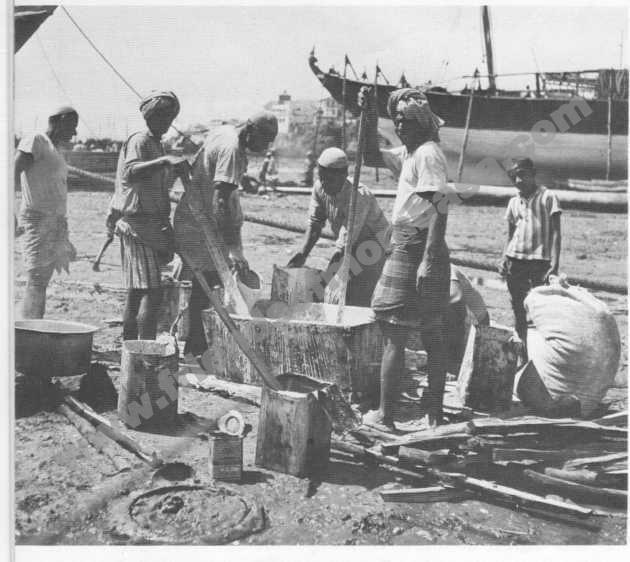 Having discharged their cargoes the dhows lie off in the Old Harbour and await their turn to go into the careening area. This part of the harbour is known as Pwakuu—the big sea front. The ships are dismasted, lightened as much as possible, and, when their turn comes, take up their positions at this part of the harbour at high water. Gins and shear legs are lashed into position along the ship’s sides and, as the tide recedes, the ship settles upright onto the bottom. Hands muster daily to carry out ship’s maintenance, and are usually assisted by Swahili boatmen. The ship’s underwater timbers are carefully cleaned and necessary repairs carried out. The whole of this part of the ship is then coated with paste consisting mainly of lime and beef fat heated up in metal containers. The Nakhodas prefer camel fat to beef fat but the former was difficult to obtain when the Shifta menace halted the big camel caravans crossing Kenya’s North Eastern Province. It is called Shahamu in Swahili and is similar to Chunam of the western coast of India. This paste is applied by hand and not by brush, and it is pressed into any crevices or other irregularities. While anything up to a dozen men are carrying out this work, an African drummer or two will beat out a rhythm to which the crew chant a shanty. It is all made to seem a happy occasion and shows us that “music while you work” is a very ancient idea. The upper timbers are also attended to but usually while the ship is lying in the stream. Here fish oil is used. A Nakhoda who is proud of his ship will see to it that the sides gleam with fresh oil. The reddish- brown colour of a recently oiled ship is most pleasing. In the ship the blocks and tackle are repaired and weaned and the metal anchor cables are greased by hand. This, too, is carried out to the strains of a sea shanty. The sails are taken ashore, usually to an open space close to Fort Jesus, where repairs are carried out. Altogether the ship is most carefully overhauled before its homeward passage. While all this is going on, the Nakhoda will be arranging the cargo for the return journey. This consists mainly of boriti (mangrove) poles for building and coffee. Nakhoda may travel overland to Malindi or Lamu to effect his purchases and will call in at whatever place offers the best bargain. Lamu is perhaps the most popular, especially as it affords a good anchorage. 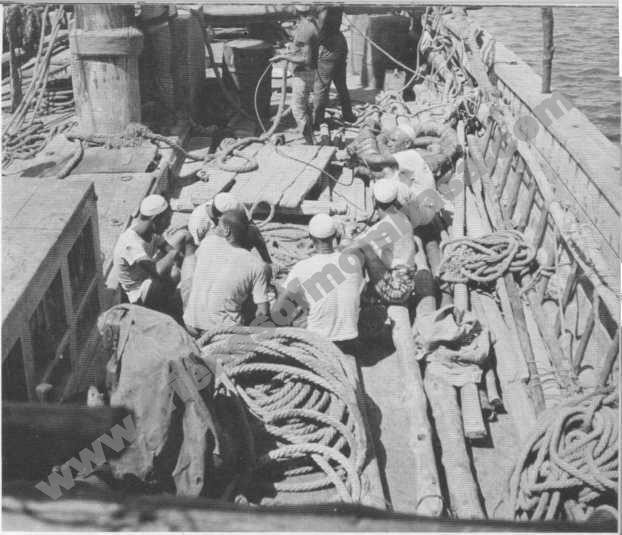 While in Mombasa the crew come ashore to sell their own private articles of merchandise and it is not uncommon to see Arabs carrying small carpets in the hope of finding a generous buyer. On the return journey one often finds the dhows racing against one another in order to reach port first and so get the best price for their good's; especially if it is known that there is a demand for such a commodity as boriti poles. The above brief description will give you some idea of the basic events of the dhow season, so let us now turn to the cargoes carried by these vessels. Above an interesting map, Island of Mombasa in the 1940’s, not many would know through time, that most of the outlets to the mainland were either by local boats or ferries along the Likoni, Mtongwe, Shanzu, Makupa (Makupa, Kupa is the word used to describe the movement of the tide out to sea. Ebbing of tide. Anyway this point is the shallowest place anywhere around the Island. One point in time, during low tide one could walk across easily). The Jain Swetamber Dera wasi Temple is of acquisitive beauty, and clever craftsmanship. Built in marble, its pillars, pyramids and domes gleam in pure whiteness, which is striking in its ornate and finely, shaped ornamentation. 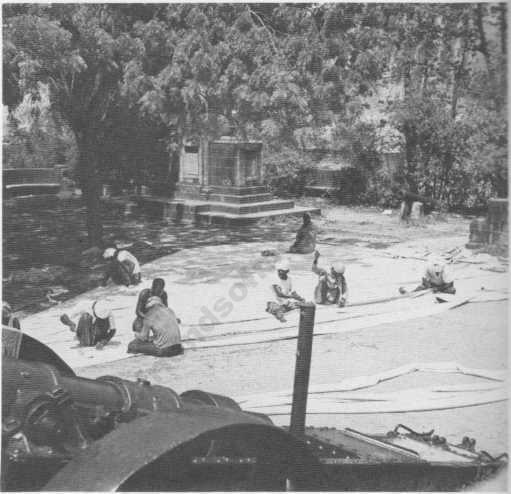 The foundation stone of the Jain Temple was laid in October, 1959, and the completed Temple opened in July 1963. This beautiful Temple is an ever popular attraction and visitors are always welcome. It is built to match the same design as the great Mount Abu Temple in Rajasthan, India. This building housed the post office which opened in 1899.This post office enabled the Indians who built the railway to send news and money home to their families. Trolley tickets were also sold here, as this was one of the trolley terminals. The post office was later transferred to Treasury Square in 1941.The post boxes were on the corner and there was a covered way leading over the road like a bridge to the post manager’s office on the other side. It was also the temporary immigration office during the World War I (1914-1918).